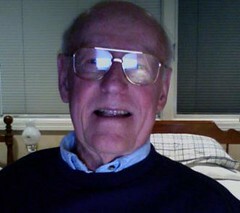 Charlie Allen's Blog: Smile! You're on CAWS 7! 'The CAWS'. Acronym for 'The Charlie Allen Weekly Scan'. A B&W, and a color example, hopefully....and if for no other reason, just the history (out here) of the ad illustration biz. Smile! You're on CAWS 7! A press photographer with snap brim fedora, wielding a big 4x5 Speed Graphic camera plus flash gun, was the norm back in the 50's. 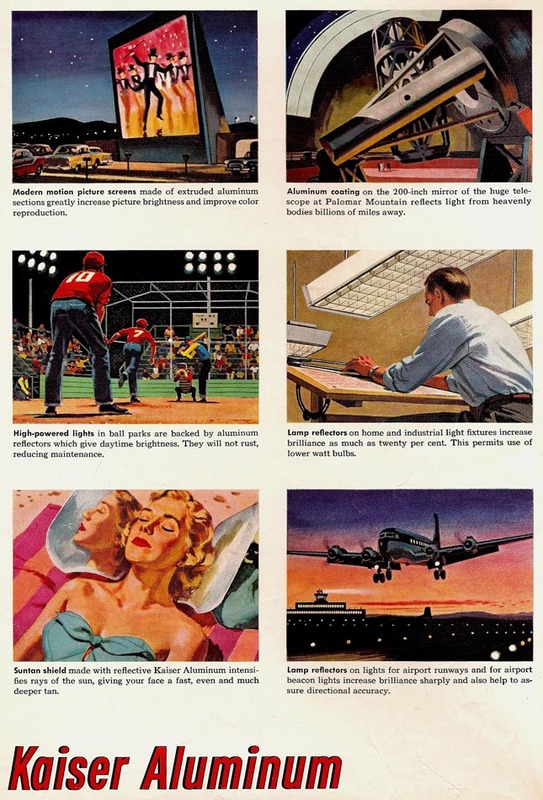 In their zeal to further the civilian use of aluminum following WW ll, and advertising nationally, Kaiser Aluminum based in Oakland, was considered by agencies and by illustrators a real 'plum' account on which to work. They seemed to me remarkably relaxed about product details....as on this flash reflector...which I believe was chromed brass or steel. Aluminum was used primarily on small consumer flash cameras. The above illustration was the left page of a double page spread in Saturday Evening Post, Newsweek, Time, etc. As shown below, the right page contained six 'spots', as we termed them, depicting aluminum uses. The scenes and product details were very much left to the artist to create. 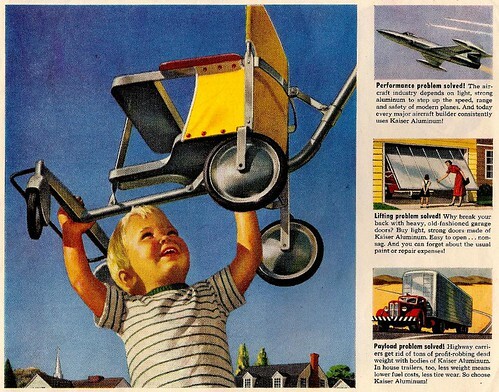 The improbable youngster, below, hoisting an aluminum stroller, was my third 'breakthrough' job in the first two years in San Francisco. Thanks to the dedicated and enthusiastic salesmanship of Chet Patterson, this was my first national magazine color ad assignment. Once again, Chet persuaded Don Sternloff at Foote, Cone & Belding to try his 'new guy'. It was done in 1950, and, once again, I sweated this one out! * For the full size versions of these scans go the Charlie Allen's Flickr set. 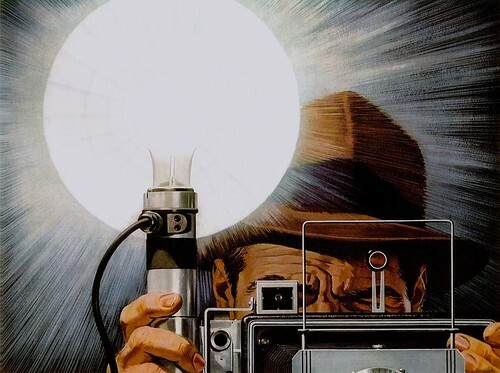 That flashlight you caught looks stellar, magnificent. Wow, that twilight vintage plane landing. I love the rendering of it. Looks to me like a DC 6 from United. Besides, I very much enjoy your "history lessons".